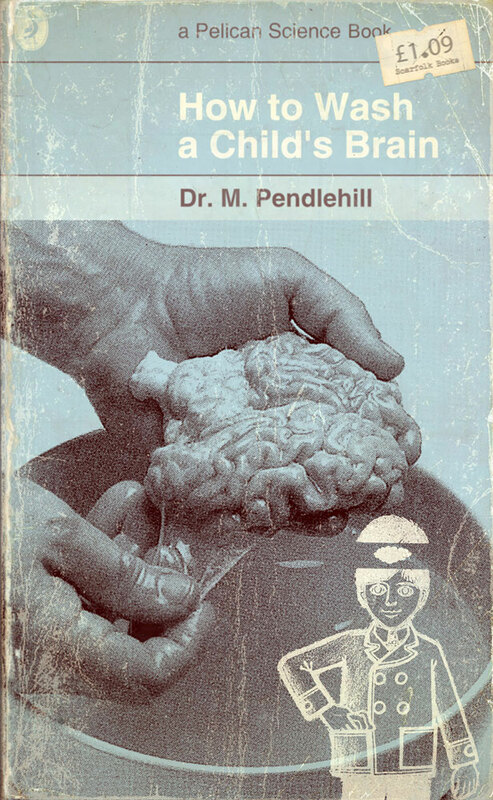 With the SHS (Scarfolk Health Service) stretched to its limits and running low on resources, parents in the early 1970s were encouraged to remove and wash their children's brains at home. In 1971 Scarfolk Council collaborated with Pelican Books to produce this handy 21-page guide to brain and cranial cavity cleansing. "... Always wear woollen gloves (or mittens) [...] After the child's brain has been removed with the two brain spoons, rinse it in a solution of vinegar, ammonia and curry powder, then rest the brain on a soft cloth or tea towel for a few minutes, or for as long as is convenient. During this time remove all your clothes and incant pagan ritual #23, as found in the appendix (of this book, not your child) [...] Do not spit on the brain or leave it near a hungry or rabid pet, such as a guinea pig [...] If the brain has swelled outside the cranial cavity and will no longer fit, simply snip away part of the frontal or temporal lobe with nail clippers and discard. This will not affect your child's development. [...] If your child has a seizure slap it and insist that bad behaviour will not be tolerated..."
I think they gave this out in my old school. You missed a trick - the book's price should have been pre-decimal. February, to be exact. Sorry, anonymous, you happen to be incorrect. Meet Mr. Rumbelows, Minister for Health.